Anne Stephenson is one of the many musicians credited on Bryan Ferry's Boys And Girls album. Anne Stephenson was the first punk to pogo out of the Guildhall school of Music and Drama. Though classically trained she loved the excitement of pop and rock music and has been playing with the foremost in the industry ever since. She fixed and led the orchestra at Wembley Arena for Paul Weller, has toured the world twice - for three years as a member of the Communards and with the Woodentops (on keyboards/vocals and violin). 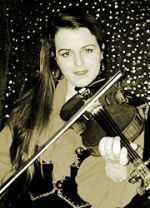 In between sessions she finds an outlet for her liveliness and energy by leading the "Brilliant Strings Quartet" and Czarjazz, a duo with Andrew Bold on guitar. Anne is also a singer/songwriter, giving concerts in 1994 with her band FireFlies. She wrote, produced and released a Christmas CD "Dance with me? Christmas Tree", in aid of Tourette syndrome for Christmas 1998. Earlier this year she composed the music with Gini Ball for a short film "Now you exist, now you don't" directed by Eki Rrhamani.